Litchfield Park, AZ is a cozy little community not far from Phoenix. In fact, it is a beautiful place to call home and many commuters choose to settle down here with their families. The lovely landscape which includes palm and orange trees give the area an almost Mediterranean feel, while miles of paths and desert landscape invite residents and visitors to explore the out of doors. No matter if you enjoy biking, hiking, riding, golfing, swimming or anything else, Litchfield Park is known for its great recreational repertoire. But living in Litchfield Park also means that you probably own a car, several bikes, a motorcycle, jet skis, roller blades and some golf clubs and you probably store those in your garage. This means, you know that your Litchfield Park garage floors have to take quite a beating. If your garage concrete floor has seen better days, contact the floor coating experts with Barefoot Surfaces to give your floors the makeover they deserve. Barefoot Surfaces has been providing quality Litchfield Park garage floor coating services for years. We believe that just because your garage floor is outside your home, it does not have to look unsightly. In fact, your garage floors need more care than any other surface in your home, because it has to repel dirt, grime, oils and much more. So the next time you go into your garage and realize that you just aren’t in love with your current garage floor, give us a call and we can discuss upgrading your floors with a beautiful and easy to maintain epoxy coat or a beautiful concrete stain finish. In fact, our coats are suitable for any concrete floor in or outside your home and your neighbors will be amazed by their beauty. Our customers often ask us which Litchfield Park Floor Coatings are the best. While they are all great floor coat options, our line of epoxy and polyaspartic floor coatings is definitely our top seller. And it is obvious why. As the workhorse of floor coatings, they adhere to the substrate exceedingly well and form a great bond. This means that they won’t peel, chip or degrade easily. They have a fabulous chemical and wear resistance which means they will look awesome for a really long time. No matter if you enjoy gardening or fixing your dirt bike, you will love that they are also easy to clean. These types of coatings release dirt readily which means that oftentimes, all you need to keep them clean is a bucket of water and a mop. 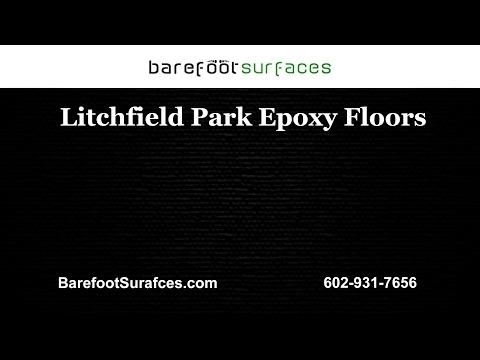 It could not be any easier to enjoy your beautiful new Litchfield Park epoxy floors. Our high traffic resistant coatings come in a myriad of color options, even metallics which makes them look spectacular. Concrete stains are our contribution to keeping the environment green and your family and pets healthy. Barefoot Surfaces concrete stains are low VOC which means you can breathe freely. This does not mean that they are not durable, in fact our stains have great UV resistant properties and are very vibrant. You will never have to worry about dulling or fading. In terms of maintenance, they are just as easy to care for as our other floor coating options. Just sweep or mop up any dirt or grime and admire your beautiful Litchfield Park concrete stained floors. The deep color penetration ensures that you will have great looking floors for many years to come. Great looking floors, do not have to be a lot of work. Our floor coats are the proof that attractive, easy to maintain floor coats exist. Having your garage concrete floors stained by our coatings expert is the easiest decision you will ever make, picking just one color, is much harder. Grind & Seal may not sound as fancy as stained concrete or polyaspartic floor coatings, but I can assure you, it can look just as spectacular. By first grinding your floors, making them smooth by removing rough areas and then applying a seal coat to it, your garage floor will look totally sleek and modern utilitarian. Many of our clients enjoy this industrial look, especially since there is no cure time involved. Once we are done, your garage floor is ready to be used. Of course, if you want a little pop of color, Barefoot Surfaces can add any stain to your floor. These sleek looking floor treatment makes your floors cool looking, and -of course- easy to clean. Our grind and seal services will make your garage floors look edgy. We put an end to dull and drab concrete floors. This treatment is suitable for any room or floor in your home, ask you Litchfield Park floor coating professional for more information about our grind & seal services. Our floor coats are suitable for any concrete floor inside or outside your home. Many of our clients suffer from allergies and thus have to forgo carpet. Our Litchfield concrete coatings are a great way to spice up boring concrete floors in your kitchen, living room, bathroom, patio, pool deck or any other concrete surface. Our experienced concrete floor coating experts are always available to answer any questions you may have. Regardless if you decide on an epoxy, polyaspartic, concrete stained or grind and seal floor, we are sure you will love it. They are so easy to clean and maintain and will prolong the lifespan of your Litchfield concrete garage floor by many years. To give your garage the ultimate makeover, check out our garage cabinet pages. We are proudly offering Slide-Lok garage cabinets that will give every item in your garage its designated space and by stowing items away and off the floor, your floors will last even longer. That’s a win-win. Contact us today to get your garage remodel and upgrade started. You will love the result.